Revitalising night care that supports the skin's essential processes of renewal. Night Serum is an essential night time care allowing your skin to breathe freely and stimulate its natural renewal processes. 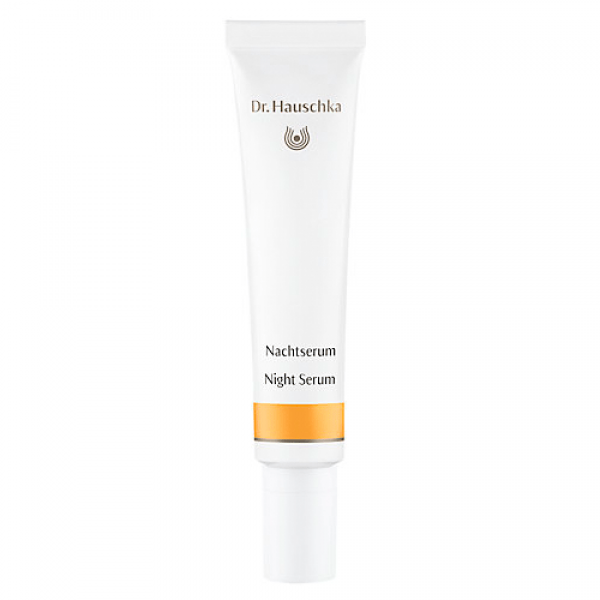 The Dr Hauschka skin care philosophy does not advocate the use of rich or heavy night creams. This is a light water based serum that hydrates the skin after cleansing leaving it comfortable and ready for sleep. A Dr Hauschka bedtime routine would be to use the soothing cleansing milk to remove your make-up, a deep cleanse with the cleansing cream to ensure skin is perfectly clean, a spritz with the facial toner and then an application of the night serum. For those of us used to applying a heavier night cream this oil free night time routine can feel strange at first but the idea is that if we don't mask the skins true condition with heavy creams, the skin's natural night time renewal processes will restore harmony, balance and comfort to our skin. As with any new routine, its important to give this a proper try. A day or two is not enough to show the true results. A new skin cell takes around 30 days from being created to showing on the outer surface of our skin. To see the true effect of any new regime you really need to give it a proper 30 day trial. Once people try the Dr Hauschka way they are usually hooked on the lovely soft comfortable feeling of their skin. Try it for yourself and see what they mean.